The world lost a towering artistic figure with the death of Paul Taylor on August 29. Taylor’s development as a titan of dance had a formative chapter during his time as a student here, and over the years, Juilliard has benefited from having a number of distinguished Taylor dancers as faculty members and by the presence of Taylor repertoire in performance on Juilliard’s stages. We can only be grateful for this extraordinarily creative individual voice, which for more than six decades has been so primary in the foundation of what dance is and can be. Here we offer two perspectives on this modern dance icon and his legacy. The first is an overview of Taylor’s legacy, written by Claudia Schreier, a gifted young choreographer who will be working at Juilliard this winter. Then on a more personal level, we share an excerpt from an article by Carolyn Adams, the legendary Taylor dancer and longtime Juilliard faculty member. Two more faculty members and former Taylor dancers, Jane Kosminsky and Linda Kent, shared reminiscences about Taylor in 2014 on the occasion of the Paul Taylor Dance Company’s 60th anniversary, and I encourage you to read those. Of dancing Taylor repertory, Kent wrote about “the joy and fulfillment inherent in performing his work.” As we mourn the passing of Paul Taylor, we can take great solace in the knowledge that his magnificent legacy of dances will always provide the opportunity for dancers and audiences to connect with his extraordinary poetic voice. A captivating dancer, eminent choreographer, and trailblazer, Paul Taylor (’53, dance; honorary degree ’88) was a chief founder of American modern dance and worldwide champion of the art form. He died on August 29 in Manhattan at the age of 88. At once a virtuosic luminary and an affable humorist, Taylor had a knack for exploring the complexities of the human experience. His work reflected an affinity for the idiosyncratic in lucid detail; across his creative canon and even within a single work, he could dissect unsavory realities and craft steps ascending to the sublime. Over his 64-year career, he created 147 dances, many regarded as breakthrough works upon their debuts that have since become pillars of the modern dance tradition. Born in Wilkinsburg, Pennsylvania, on July 29, 1930, Taylor was raised in the Washington, D.C., area. A nexus of academia and the arts launched his trajectory: it was at Syracuse University, where he enrolled in 1947 with a swimming scholarship, that Taylor first discovered his love for dance. He began his formal dance training in 1951 and made an auspicious connection with Martha Graham at the 1952 American Dance Festival at Connecticut College. That fall, Taylor enrolled in Juilliard’s dance division, which had opened the year before, for what would prove to be a singularly influential year, studying with Graham (faculty 1951–77), Doris Humphrey (faculty 1951-58), José Limón (faculty 1951–72), Louis Horst (faculty 1951-64), Margaret Craske (faculty 1951–66), Alfred Corvino (faculty 1953- 94), and Antony Tudor (faculty 1951–71), among other distinguished faculty members. 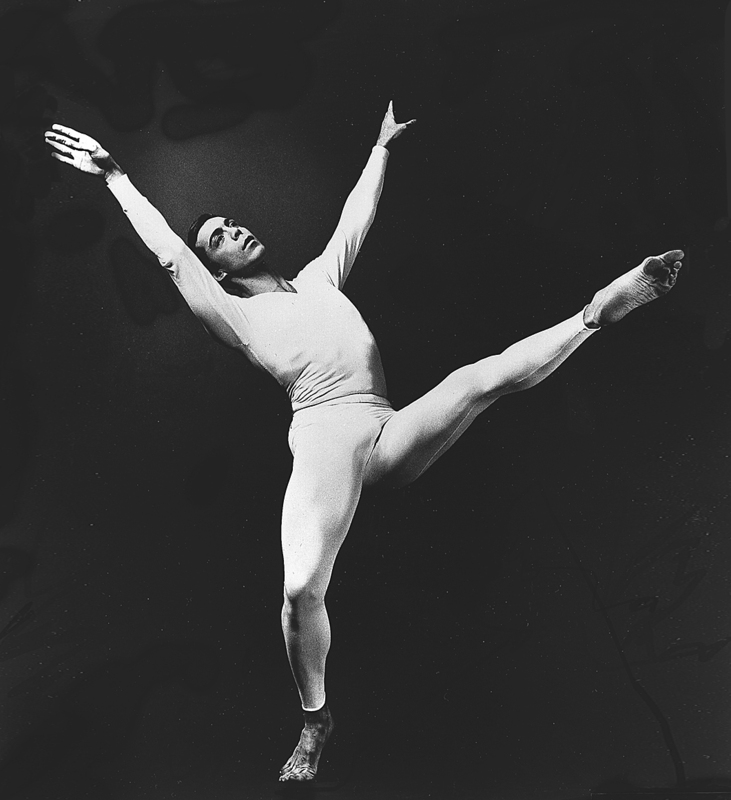 Taylor embarked upon his professional dance career in 1953 as a founding member of the Merce Cunningham Dance Company. The following year, he gathered his own small group of dancers and began to create. His first work, Jack and the Beanstalk, a collaboration with the artist Robert Rauschenberg, was performed at the Henry Street Settlement in Manhattan. In 1955, Taylor accepted Graham’s invitation to join her troupe and embarked upon what would become a sevenyear career as a soloist with the Martha Graham Dance Company. In 1959, George Balanchine invited Taylor to perform as a guest artist with New York City Ballet and created for him the monumental solo from Episodes, a work that Balanchine and Graham choreographed in tandem. While continuing to receive praise as a dancer for his commanding figure and striking elegance, Taylor forged ahead with choreography. His versatile creations were a marvel from the outset; pieces like Duet (1957) and Orbs (1966) vividly reflected the influence of the avant-garde era, while others, such as landmark works Aureole (1962) and Esplanade (1975), captivated audiences with their abstract splendor and poignancy. Their groundbreaking premieres led Taylor to achieve legendary status mere decades into his career, even before he became known for his prolific output. It was Taylor’s trademark to pair classical music with modern dance, but his musical selections were as diverse as his subject matter, drawing upon genres ranging from 18thcentury baroque to tango to barbershop quartets. His many celebrated—and sometimes controversial—works include Runes (1975), Cloven Kingdom (1976), Airs (1978), Le Sacre du Printemps (the Rehearsal) (1980), Arden Court (1981), Company B (1992), Piazzolla Caldera (1997), Promethean Fire (2002), and Beloved Renegade (2008). Taylor continued to create into the last months of his life; his company premiered his final work, Concertiana, in March. Taylor received countless awards and honors, among them a Kennedy Center Honor, an Emmy, the National Medal of Arts, and a MacArthur “genius” grant. He was the subject of Matthew Diamond’s award-winning documentary, Dancemaker, and wrote a critically acclaimed autobiography, Private Domain, both offering fascinating glimpses into the impact wrought by his genius. At once a virtuosic luminary and an affable humorist, Taylor had a knack for exploring the complexities of the human experience. The Paul Taylor Dance Company (PTDC) has performed in more than 540 cities in 64 countries, and repetiteurs affiliated with the company have restaged his works for numerous other professional companies and at universities around the globe. His work was staged more than 20 times over more than two decades at Juilliard, including Esplanade (1981, ’83, ’84, ’94, 2004), Aureole (1982, ’85), Three Epitaphs (1982), Cloven Kingdom (1985, ’97), Diggity (1987), Duet (1988, 2001), Arden Court (1989), ​​Airs (1991), Sunset (1996, 2013), ​​​​Roses (1988, 2016), ​Musical Offering (2001), and Last Look (2010). Many were staged by faculty member Linda Kent (BS '68, dance), who danced in Taylor's company. In 2014, PTDC announced the establishment of Paul Taylor American Modern Dance, which expands the company’s mission, ensuring that Taylor’s legacy lives on not only in the preservation of his own works, but in the presentation of work by other giants of modern dance and through the cultivation of new creative voices. In 2001, Juilliard dancers performed Paul Taylor’s Musical Offering, choreographed in 1986 to the music of J.S. Bach, in honor of the choreographer’s 70th birthday. Carolyn Adams, who served on the Juilliard dance faculty from 1984 to 2011 and was a principal dancer with Taylor’s company from 1965 to 1982, wrote about him in the February 2001 Journal; here are some excerpts from her article. “Musical Offering … is a work of passion, beauty, and stillness. It is filled with motion and patterns and yet it washes over us as a breathtaking still life. It is perhaps one of the most moving and spiritually charged works of a Renaissance man who is a dance-maker, painter, writer, swimmer, carpenter, gardener, and mentor. I can’t pretend to be an innocent bystander. I simply adore the man. He gave me my first job, stood by me, made great works on me, and was gracious enough to let me quit before he fired me. Life doesn’t get any better than this, except for the fact that I get to teach the most gifted dancers on the planet at Juilliard and see them dance his works. “… As a dancer, one doesn’t always understand how frustrating it is for choreographers trying to get what they want from us. Sure, they can hire and fire us—but mainly they’re stuck with us. So, what’s the transaction about? A little faith, a little hope, some craft and collaboration, and a lot of patience. How did Paul know which of us to pick for each dance? It took me and my husband, Rob, three years to pick out a couch (and we’re still not sure we like it). It’s all in that editing process, those wonderful choices, including the relinquishing of a great idea that comes at the wrong time. How evolved one must be, to let go of an idea so that another one can emerge! I can’t think of a better description of creation.